WGS has a wide selection of quality left handed golf clubs on its Online Superstore. 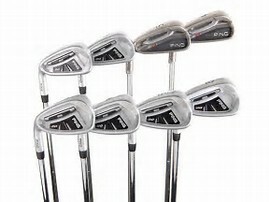 If you’re looking for the best quality golf clubs on the market, WGS has hundreds to choose from. WGS has the finest in men’s quality left handed golf clubs, which includes starter sets for the beginner golfer up to top-of-the-line for the experienced golfer. This includes the most popular golf clubs manufactured, as well as golf clubs made by other top manufacturers. WGS‘ online Superstore also has ladies left handed golf clubs as well. There you can select from all the top golf club manufacturers on the market today! In addition, left handed junior golf clubs are available too! Steel shafts will offer the greatest amount of feedback and control during the swing, and are a little bit heavier. On the other hand, if you want to achieve faster swing speeds and distance you will want to use a lightweight graphite shaft. You’ll enjoy less vibration feedback too. Also, if you suffer from golf elbow or arthritis, graphite would be the better choice. The shaft of the golf club is often ignored when it comes to performance, but it is the engine of the golf club. The length, flex, torque, kick-point, weight and alignment of the shaft all have an effect on the performance of your golf club. For more information on golf club shafts and shaft technology, see our separate page on the topic now! I am a south paw and I am in need of new clubs….long story. I do have a question. Is the graphite going to be a better way to go if I am still in the “learning” stages of golf? Are they more expensive, and if so worth the investment? I like the idea of them being lighter and getting a faster swing speed and more distance. I only know too well, that this could definitely help me. be better for your swing mechanics. Graphite is better for players as they get older. I would recommend for ladies and senior players to use graphite in all clubs except the wedges and the putter. This is perfect! My dad is a lefty, and he wants to get a new set of clubs. He has an older set of steel shaft Taylor Made’s. However he was talking about going with a set of graphite Calloway’s. This would make a great Christmas present for him. I myself do not golf much, to me a club is a club! can you give me a direction on the middle to upper sets that Calloway has to offer? Thank You Brendon for your comments. The middle line Calloway Irons are the Steelhead XR with graphite shafts. Top of the line – Calloway Big Bertha OS with graphite shafts. Does he play a senior Flex shaft? Also, these iron sets have hybrids in them if he desires a hybrid or two. Calloway makes excellent irons. I, myself play Calloway irons. I love them. Edwin Watts has a great selection. I love golf and anything golf . It is always good to read up on any new club out there, or anything about the kinds of clubs one should use. I am using steel shafted clubs right now, but I am getting a little older and possibly could be looking for graphite shafts soon. WGS has a great selection of graphite shafted golf clubs to choose from. Also, be sure to get the right flex for your swing speed. If you get fitted for your new clubs by a professional, have him fit you with the right golf ball as well. Not all golf balls play the same. Good time of the year to trade in your old set and get a new one with the holidays around the corner. WGS will be running sales very soon starting on Black Friday!